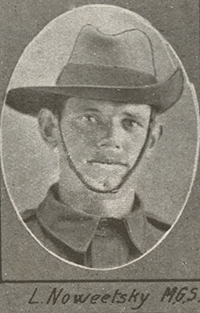 Leonard Noweetsky, a former draughtsman, survived Gallipoli only to be killed at Tel-el-Kebir (Egypt) in a bizarre accident when a roller got loose as he was attaching horses to it. The Board of Inquiry found no one was to blame. 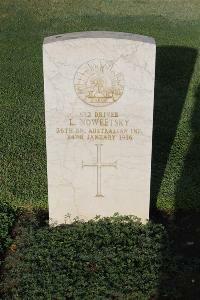 Noweetsky's personal effects -- a language book, letters, photos, papers -- never reached his mother in Zmerinka (Ukraine). 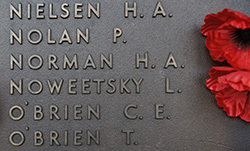 His name on the Roll of Honour at the Australian War Memorial and a thin file with a few pages detailing his service in the AIF are all that remain of him.